As we age, our bodies change in many ways. You may notice it becomes more difficult to complete routine tasks; perhaps you’ve experienced a loss of balance, or difficulty lifting heavy items. These may be signs of Sarcopenia—or a change in muscle strength and function due to loss of skeletal muscle mass. Sarcopenia can act in conjunction with other common conditions, like osteoporosis, to cause slips, falls, and injuries that can lead to serious disability and prevent you from performing daily tasks. Sarcopenia is believed to be a natural part of the aging process, but there are many factors that can contribute to, worsen, or accelerate the development of the condition. 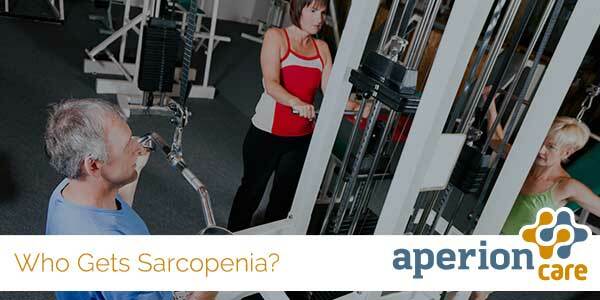 How Do You Treat and Prevent Sarcopenia? There are many ways to help reduce your risk for Sarcopenia or help restore muscle mass after a Sarcopenia diagnosis. Your doctor may prescribe a treatment or prevention regimen that includes physical activity (specifically resistance training exercises), hormone replacement, and/or dietary supplements. Aging adults should consume high-quality protein, lots of fruits and vegetables, and reduce intake of cereal grains. Aging adults may also consider supplements containing creatine, whey protein, vitamin D, and Omega-3 fatty acids. Your doctor may draw blood to track hormone levels and correct imbalances with hormone replacement therapy. Regular physical activity, specifically resistance or weight training, is crucial to combatting muscle loss and rebuilding diminished muscle strength. To learn more about rehabilitation after a fall or participating in a therapy program to retain muscle and bone strength in older age, contact your local Aperion Care facility. Consult your doctor before making any changes to your diet or lifestyle.